As of the 18th of April, 2015, Visa Europe will have new rules for Recurring Transaction Agreements (RTAs). This is important because many businesses that perform online transactions use RTAs, especially any digital or shipping services that operate on a subscription model. Visa is widely used in Europe, so their updated rules are important reading for merchants and businesses operating in the European Union. 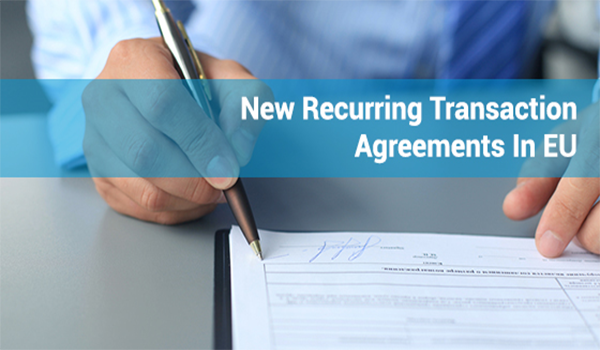 What are Recurring Transaction Agreements? Recurring Transaction Agreements, also known as Recurring Payment Agreements, are multiple transactions processed at predetermined intervals of time of no longer than one year between transactions which represent an agreement between a customer and a merchant to purchase goods or services provided over a period of time. RTAs are very popular with subscription-based services. For example, many online streaming sites provide their content to consumers based on a monthly fee often paid via an RTA. Notify customers before the expiration of free trials, introductory offers, and promotional activities, ie: a merchant cannot have a cardholder’s free trial rollover into a paid subscription without first notifying the cardholder prior to the end of the trial. Notify customers of any changes to the RTA and to upcoming payments after long gaps in between payments. Submit an Account Verification message when no immediate payment is required. In the event of a non-approval response from the cardholder, no subsequent Recurring Transactions may be submitted under the RTA, and merchants must address this matter with the customer. Inform the customer of the amount of the recurring transaction, whether the amount is variable or fixed, the date of the recurring transaction, and whether the date is fixed or variable, as well as establishing the customer’s prefered method of communication. Once the customer has provided their consent to the RTA, the merchant must provide confirmation within two business days, using the agreed upon method of communication. More than six months have passed since the previous payment. The expiration of a trial period, introductory offer, or promotional activity. Any change to the amount or date of the recurring transaction.